Whenever you buy a new smart phone your first priority is to keep it in its original condition for as long as possible. When you talk about the condition and maintenance of your phone the most visible and important part is the screen, we want our screen to be scratch free and for this screen protection is essential. The main question is which screen protection to choose; Glass or Plastic. The main aim of this article is to tell you the pros and cons of both screen protectors and by the end you will be able to choose which works better for you. Starting with the price the plastic protector is the winner here, you can get these really cheap for like $1 to $10 for a pack of 5, whereas the glass protectors cost more starting from $2 to $ 35 roughly. The cost varies because of the quality of plastic and glass, it also depends on oleophobic coating of these protections. The strength or toughness of these materials varies. The glass protection is tougher than the plastic one. This is because of the thickness of the material, a glass protector is somewhere between 0.3mm to 0.5mm thick and the plastic protector is 0.1mm. This thickness contributes to the strength and durability of the material. Here glass protection has an edge over the plastic. New smartphones have a scratch less glass like gorilla or any other. The main difference between old and new phones is the smoothness of the touch screen. Adding a plastic protector reduces the smoothness and sensitivity of the touch whereas the glass gives a more original effect. For some people the look of their phone is more important than the protection, a plastic protector has a more finished look as compared to the glass protection. The glass covers tend to bulge out because of their thickness. They are raised from the side which can slightly compromise the look of your phone, this issue mainly comes with HTC one and iPhone 5. Plastic wins this one. The installation of plastic is different and more difficult as compared to the glass. 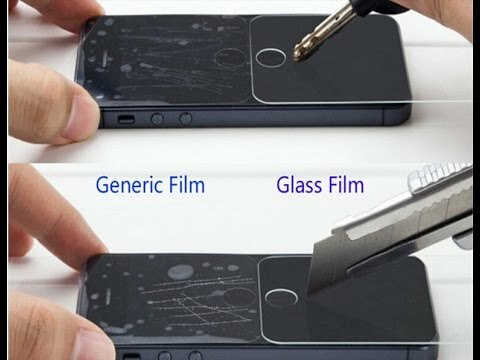 In glass protection you have different varieties of glass like bezel adhesive and full adhesive etc. these different types are easier in installation than the plastic. So here glass wins again. If you choose to go with the glass protector than make sure you choose the one that is slightly expensive in cost, also get the glass protection from renowned companies as some of these even offer low cost replacement policy for a year. The plastic ones as pretty much the same, but if you opt for that make sure you get the installation right. When buying a protector remember to buy the one that is highly recommended for your phone in this case you will end up with the best fit. All in all both are good but according to the points discussed in this article Glass protection is a winner. Choose wisely and experience the best. If you are unsure on deciding the screen type or how to install the screen protector, you can try to contact the phone screen repair store in your neighborhood, they will always be able to help you out on the installation.